The University of Oregon School of Journalism and Communication was originally established in 1912 as the university’s department of journalism. It was restructured to form the School of Journalism a few years later in 1916, becoming the first professional journalism school in the American Northwest. Today, the school is housed in Allen Hall on the university’s main campus and is one of only 112 schools of journalism to receive accreditation from the Accrediting Council on Education in Journalism and Mass Communications. The School of Journalism and Communication also operates the George S Turnbull Portland Center in Portland, Oregon. Students of the School of Journalism and Communication produce Flux magazine, which has been the recipient of a number of awards. Other student-run media include the Oregon Daily Emerald, the Oregon Commentator, and another magazine, Ethos. In addition, two radio stations are broadcast from campus: KWAX, which features classical music, and KWVA, which serves as a campus radio station. Even on the highly respected UO campus the school stands out; 10 of the 11 Pulitzer Prize winners who were alumni of the University of Oregon are School of Journalism and Communication graduates. In keeping with the school’s stated emphasis on ethics, social responsibility, and the public interest, it is the presenter of the Payne Award for Ethics in Journalism. The School of Journalism and Communication takes a liberal arts approach to the teaching of communication and journalism, grounding students in a well-rounded base education that allows students to choose from a number of majors in the fields of journalism or communication. Award winning journalists, celebrated communicators, bestselling authors and renowned academics comprise the faculty of the school, and faculty members are encouraged to design programs to meet the needs and interests of students. Educational and career development opportunities abound even outside the classroom. Students have the chance to learn from a different guest speaker almost daily and can take advantage of internships to enhance their resumes and increase their knowledge and understanding of the field. Networking is encouraged and facilitated by student organizations. The school offers Bachelor of Arts and Bachelor of Science degrees in journalism, communication studies, public relations and advertising. Master of Arts and Master of Science degrees are available in Communication and Society, Literary Nonfiction, Journalism, Strategic Communication and Multimedia Journalism. Doctoral programs include a Doctor of Philosophy Program in Communication and Society, as well as a concurrent Juris Doctorate and Master of Arts or Master of Science degree in Communication and Society. Graduate students can add a Certificate in Communication Ethics to their credentials. The School of Journalism and Communication is one of eight schools that make up the University of Oregon (OU), a public university with a main campus located in Eugene, Oregon. Established in 1876, OU is the third-oldest public university in Oregon. UO is classified as one of only 108 very high research schools by the Carnegie Foundation. The school has a student body of nearly 25,000. The OU campus covers 295 urban acres. UO has been ranked 101 among American schools by U.S. News & World Report and 79 by Washington Monthly. The school’s colors are green and yellow, and its athletic teams are known as the Oregon Ducks. The mascot has historically been Disney’s Donald Duck. Disney founder Walt Disney gave OU verbal authorization to use Donald Duck’s likeness during his lifetime, and despite legal challenges from his successors at the studio, Donald is still the mascot today. The school boasts 18 varsity sports teams and is a member of NCAA Division I and the Pacific-12 Conference. OU teams boast 14 NCAA team championships and 60 NCAA individual championships. Although the school is best known for its track and field team, one of America’s oldest college football rivalries has existed between OU and Oregon State University since 1894. Referred to as the Civil War, the rivalry is temporarily settled each year during the final game of the season. 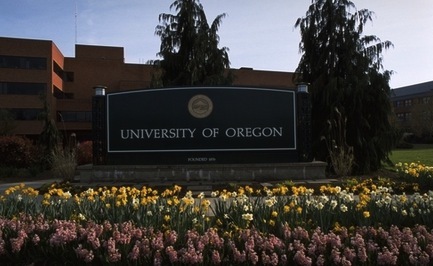 Eugene, Oregon, site of the OU main campus, is located within close proximity to the Willamette River, the Cascade Mountains and the Pacific Ocean. It is only a short drive from the bustling city of Portland, Oregon. OU is home to the Oregon Experiment, a pioneering approach to campus planning which allows campus layout to evolve gradually and naturally with strong input from students, faculty and others who use the campus. As a result, a natural flow has been established on campus. Buildings and features are located conveniently in relation to one another. Eight residence halls ensure students have the option of living on campus, and a new hall that is still under construction reflects the university’s desire to increase enrollment over the next few years. More than 250 officially sanctioned student groups thrive on campus. Traditions grow strong on a campus that is over 100 years old, and OU is no exception. A number of traditions, both sanctioned and unsanctioned, have arisen at the school. For example, acapella singing takes place every Friday evening in the area around the student union. The ironic statement, “It never rains at Autzen stadium,” is announced at each football game. Street fairs are held on campus along 13th Street twice yearly. National Lampoon’s Animal House was shot on and around campus and features Greek houses and university buildings as the settings for Delta House and other locations. Other movies have been filmed at OU through the years, starting with “Abe Lincoln in Illinois” in 1940 and including the critically acclaimed Stand By Me in 1986.